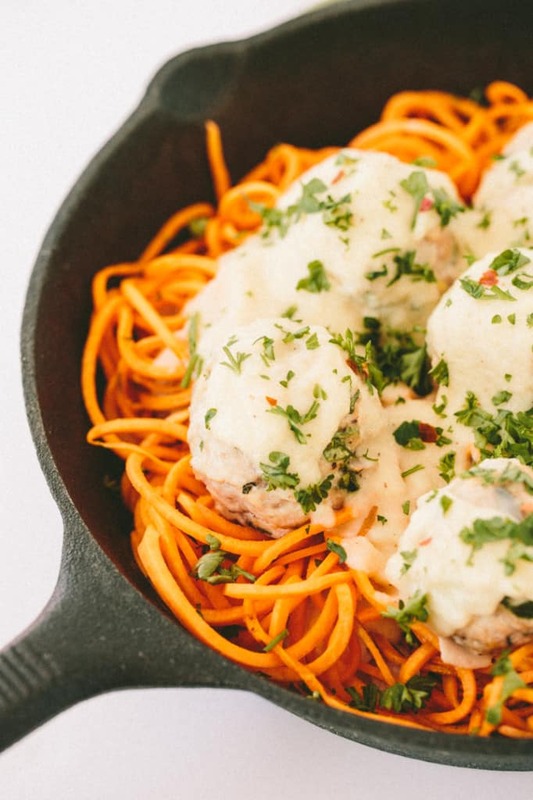 I’m really excited about today, not only because this recipe is hands-down my favorite meatball recipe to date, but because our Brand & Community Manager, Meaghan, goes from part-time to full-time, officially today! I’ve been waiting for this moment for so long and I’m probably doing a happy dance somewhere in my apartment right now, as this posts. Or, sipping coffee, trying to wake up. Either or…. Meaghan is amazing. If you’ve ordered an Inspiralizer, you may have heard from her – she heads up our Customer Service effort. Otherwise, she works on a lot of fun projects with me and comes up with many of the fun ideas you see on our social channels! Also, she totally owns our @theinspiralizer Instagram handle. She’s the sweetest and a total worker bee. Now, she’s all ours here at Inspiralized! I can’t wait to use her skills to their full potential and bring some fancy new content your way. You’ll probably first notice more engaging Periscope videos (our username is Inspiralized) but other than that, just stay tuned! 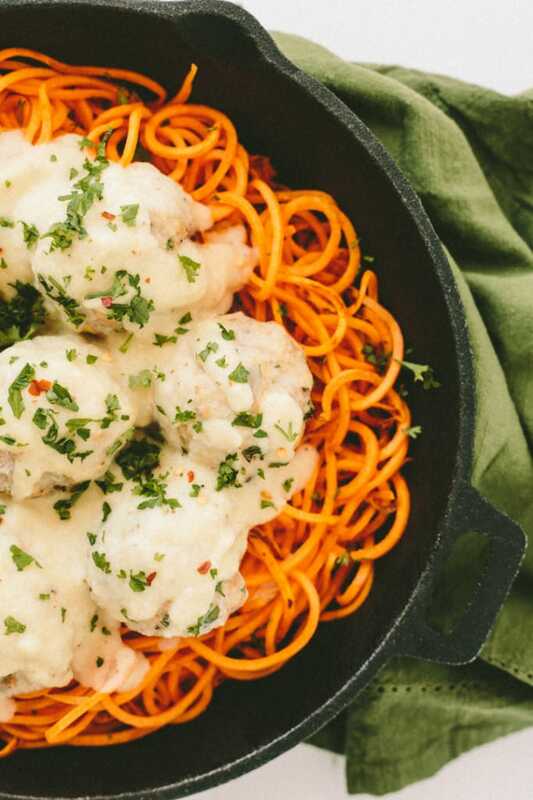 Now for this recipe: I’m in a “can’t stop, won’t stop” state of mind right now with the spiralized sweet potatoes. They’re quickly becoming my favorite vegetable to spiralize! like I said, it’s my favorite meatball recipe to date. Why? The combo of the cauliflower alfredo with the sweet potatoes is SO good. I really couldn’t find a better adjective, because the combo of flavors happening in this recipe are just solid. Really good. 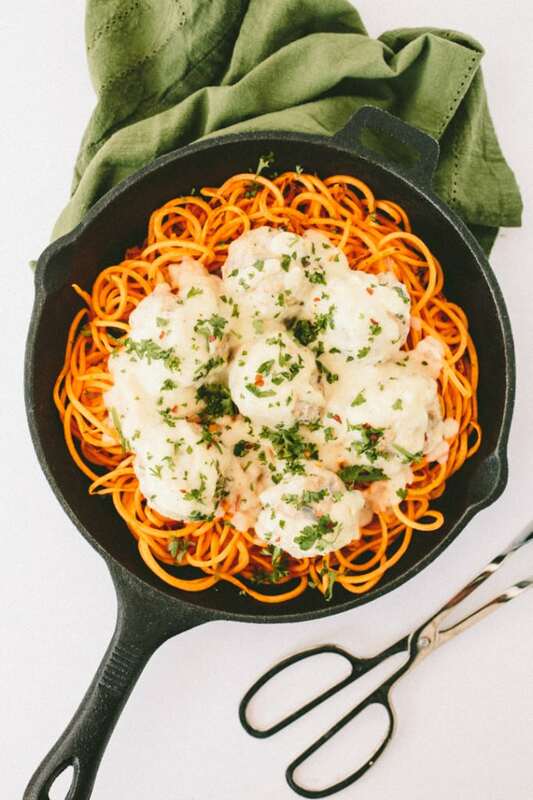 These pictures may display it as a skillet dish, but it doesn’t necessarily have to come out that way – the recipes call for you to transfer the noodles into a serving bowl and top with meatballs and then the alfredo sauce. I just decided last minute, for presentation purposes, to keep it in the skillet. Pretty, right? However you choose to plate/serve this, it’s going to be a home run! Just note that it can be time consuming, so just make sure you prep every little ingredient before starting and then it’ll go very smoothly. I’m actually thinking of doing a video on my top tips for becoming a Zen cook! The first tip? Prep, prep, prep. Make the meatballs: combine all of the meatball ingredients into a large mixing bowl and stir together. Then, shape the meat mixture into golf ball sized meatballs, about 8. Place on the baking sheet and bake for 15-18 minutes or until juices run clear and meat is cooked through. Meanwhile, make the sauce: Place the cauliflower florets in a large pot and cover with salted water. Bring to a boil over high heat, then lower the heat to medium and cook for five to seven minutes or until easily pierced with a fork. Remove the cauliflower with a slotted spoon. Heat the one teaspoon of olive oil in a medium nonstick skillet over medium heat. When the oil is shimmering, add one garlic clove and cook for 30 seconds or until fragrant. Add the shallots and cook for two to three minutes or until translucent. Transfer to a high-speed blender or large food processor, and add the cauliflower, the broth, nutritional yeast, mustard and lemon juice. Generously season with salt and pepper and blend the sauce until creamy, about one minute. Set aside. Prepare the pasta: place a large skillet over medium heat and add in the olive oil. Season with salt and pepper and cook for 7 minutes or until cooked to your preference. While pasta cooks, place a small pot over heat and pour in the cauliflower alfredo. Cook until heated and then let simmer until sweet potato noodles are ready. 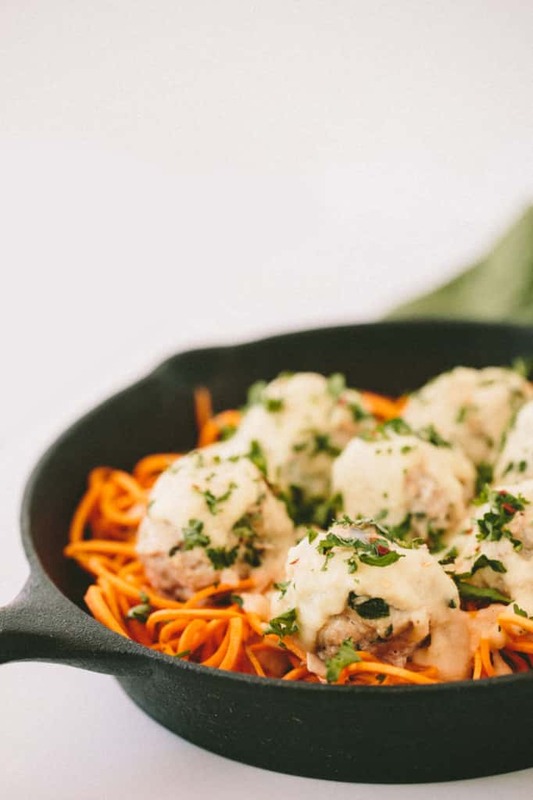 When pasta and meatballs are done, transfer the sweet potato noodles to a serving bowl, top with meatballs and pour over the cauliflower alfredo. Garnish with parsley. What is nutritional yeast? Can something else be subbed in for it? this looks totally amazing! You can leave it out, but it adds a cheesy flavor to the alfredo! You can sub in real cheese, like a parmesan! Yummmmmmmmm!!!! And congrats to Mehgan!! Looks great. I'm a vegan so I think I will try with veggie "meatballs." As a cook with meager skills and limited experience, some questions have occurred to me. In step 5, should we assume that we should add the inspiralized sweet potatoes, the "noodles," after the olive oil? by "cook until done," what do you mean? Should we toss the noodles in the oil? Then what? Let them cook undisturbed? Cover the skillet? Keep heat on medium, or lower the heat? I would worry that the sweet potato noodles would stick to the hot skillet surface. I assume that was not a problem in your cast iron skillet? Thank you for posting a recipe that is dairy free but not vegan. Not easy to find for those of us that are meat eaters with dairy allergies. This looks delicious. I can't wait to try it. I feel the same way about sweet potatoes! They are so versatile. Making this dish tonight with some chicken sausage for a quick and dirty version. Love the cauliflower alfredo! Yum!! I absolutely love sweet potato noodles; you're sweet potato "shoestring fries" are the best thing ever. Plus cauliflower sauce? Omg. I might try this with tempeh instead of chicken, or chickpeas. Thanks Ali! We made this tonight with ground turkey instead of ground chicken. Very good. Meatballs and sweet potato noodles were awesome. Sauce was a little lack luster. I think next time I would add more nutritional yeast for the "cheesier" flavor. Yum! Girl how do you think up delicious recipe after delicious recipe? I think you should be able to use zucchini noodles in place of the sweet potato or even spaghetti squash. Ali this was amazing!! Made it for dinner tonight. Husband loves it too!! Keep em coming!! Delicious! I made it for just two people so used only one sweet potato and a half recipe of meatballs, but a full recipe of cauliflower sauce (to use up leftover cauliflower). A nice meal that filled me up but didn't weigh on my stomach. Very inventive! I made this yesterday for Sunday dinner. Delicious! I substituted 2 tbsp. of grated Parmesan Reggiano in place of the nutritional yeast. Then I added 1-2 additional tbsp. on top and red pepper flakes for heat. Really enjoyed this, felt indulgent but it's so healthy! Hey Ali.... could you possibly make this cauliflower sauce ahead of time and just reheat before you make this meal? Thanks!